Hitch a ride! 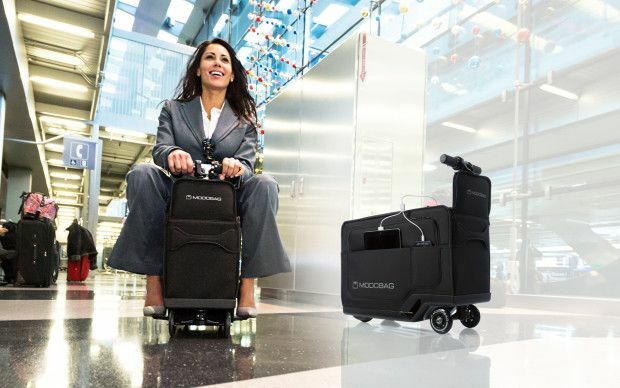 Tired of schlepping your bags through the airport, rushing to your gate to make a tight connection? Tagged as the carry-on that carries you, Modobag is a unique way to travel, literally and figuratively. This mild mannered suitcase has an electric motor that comes complete with a telescoping handlebar with throttle and brake. Hop on the memory foam cushioned seat, pop out the ergonomically-designed foot rests, and zip to your gate at speeds of up to eight miles per hour and a range of 6 miles. It’s TSA and FAA compliant, holds about 85% of what a typical 22″ carry-on bag will store, has a padded compartment for your laptop or tablet, dual USB charging ports, and optional GPS tracking. You will certainly get some looks at the airport, but have some fun with Modobag!